On this program, we're highlighting a new project from bassist and composer Ark Ovrutski, called "Journey Moments," which includes two players who have become almost "regulars" on this show, pianist Benito Gonzalez and drummer McClenty Hunter Jr.. Ark Ovrutski grew up in Ukraine. He was born in Kiev and started out on violin as a child. His father loved jazz, and pretty soon so did Ark, who switched to the bass, and cites Charles Mingus as a major inspiration. 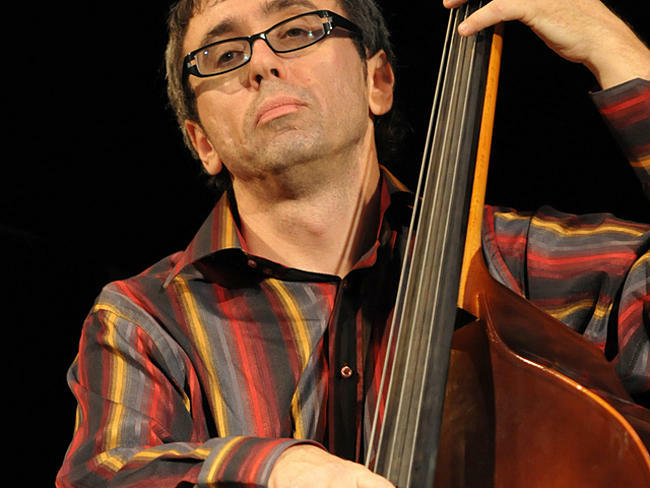 Ovrutski studied in Russia, headed up a house band at a club in Poland for a while, and played all over Europe, finally coming to the United States both to advance his education (he wrote a doctoral thesis on the bassist who most inspired him, Charles Mingus) and expand his career as a performer and recording artist. We'll hear two of his original compositions, and his cover of a Wayne Shorter classic that Art Blakey's Jazz Messengers played when Shorter was in the band. We'll also hear a rare recording of Art Blakey's Jazz Messengers, and some previously unreleased music from guitarist Grant Green and his band from a Canadian jazz club called "Oil Can Harry's" in 1975, and, speaking of Benito Gonzalez, music from his new album with drummer Gerry Gibbs and bassist Essiet Okon Essiet, "Passion Reverence Transcendence: The Music Of McCoy Tyner." Hear Blue Dimensions Saturday nights at 11:00 pm on KRCB-FM Radio 91 / streaming @ radio.krcb.org / Comcast channel 961 throughout the Bay Area / Download the FREE KRCB App @ iTunes & Google Play!